This online boating safety course is approved by the Tennessee Wildlife Resources Agency as a study tool for those persons required to take a proctored exam in a classroom setting (born after January 1, 1989 to operate any powered vessel). Successfully completing this exam will prepare you to obtain the Tennessee Boating Safety Certificate. If you are under 11 years of age, you can use the course and exam as a study tool but you are not able to take the proctored exam until you are at least 11 years old. If you were born on or before January 1, 1989, please view the information page. Complete the following 3 steps to get your Tennessee Boating Certificate. 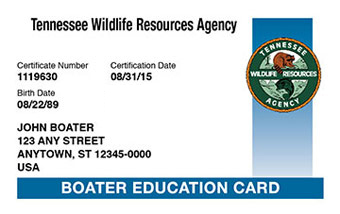 To receive your official Tennessee Boater Education Card, you must take a proctored exam in a classroom setting. To book your final exam, visit the TWRA website at www.tn.gov/twra/boated.html. Note: You must be at least 11 years old to take the proctored exam. Boater Education is required for all persons born after January 1, 1989 who operate a powered watercraft on Tennessee waters.